I am pretty sure that any parent of a boy, especially one in sports has one of the best stocked medicine cabinets. Its seems like injury and boy are synonymous with one another. However, rarely do medicine cabinets do the best good in emergency or evacuation situations. And they don’t do much good at all if you are not at home. With respect to emergency situations, it is recommend that you have an emergency first aid kit in your house and a car first aid kit. You can buy your own or you can make one. Personally, I find that I always add to kits when I buy them. That being the case, I prefer to make my own. Not only can I pull from my excess supplies and save money but I can usually find containers or other storage items from around my house. I will say this particular emergency preparedness item can cost a little bit of money BUT it is necessary. Money Saving Tip: Believe it or not, DollarTree and 99 Cent Store have perfect size items for emergency kits and only cost a $1 per item. Though this can still add up, it does allow you to save over regular retail costs, get more for your dollar AND allows you to slowly gather these items versus one big bulk purchase. If your family is like mine and sticks to a budget, this can help you do so. 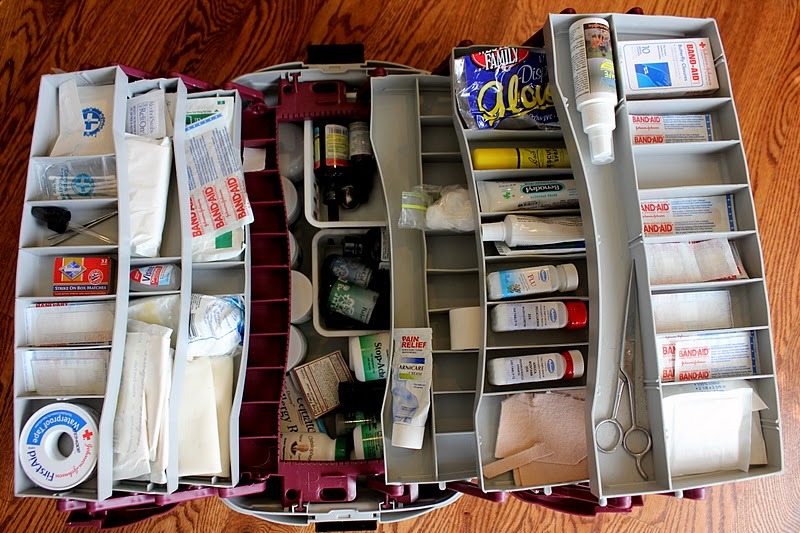 I found one blog site, Abide with Me, that used a larger fishing tackle box for their family emergency first aid kit. I think it is an awesome idea! Not only do tackle boxes have tons of compartments but they also have a huge section in the bottom. Plus the pullout sides that make seeing items easy and easily accessible in an emergency. emergency contacts such as highway patrol, fire department, local hospitals, etc. As you put your kits together or if you buy your kit, here are a few things to keep in mind. Store your family house kit with your 72-hour emergency kit. Make sure everyone knows where it is located AND the rules about using the kit. Don’t keep your car it in the trunk. Keep it in an accessible location on the inside of your car where you could reach it from the front seat if needed. Check it regularly and keep it stocked of items you may have used. Keep it for emergencies only. It can be tempting to pull from it when you run out of something, like aspirin. But if you use it for regular uses, then it won’t be there in an emergency. Make sure you rotate out expired items. Having a kit that is full on non-useable items is just as dangerous as not having a kit in the first place. I am actually really looking forward to putting our kits together. We have a-whole-lot of extra supplies and not only will my kits get put together but I can clear out some space in multiple locations that are housing our medical and first aid supplies! Extra space is awesome! Pingback: Emergency Preparedness: First Aid Kits | Wife, Mom, House...Oh My!